The third generation of CoastKey was released to market in April 2018. Our latest generation presents many new and exciting changes from the original CoastKey, which was launched in 2005. What started out as a simple wireless kill switch has become a modular system that allows complete customization to your needs, allowing seamless communication between the boater and the boat. The base system is a keyless ignition system, which allows the engines to be started without the keys by entering in a customer specific PIN code. The system can be custom tailored from here to add remote start from a FOB, which also acts as a wireless kill switch. 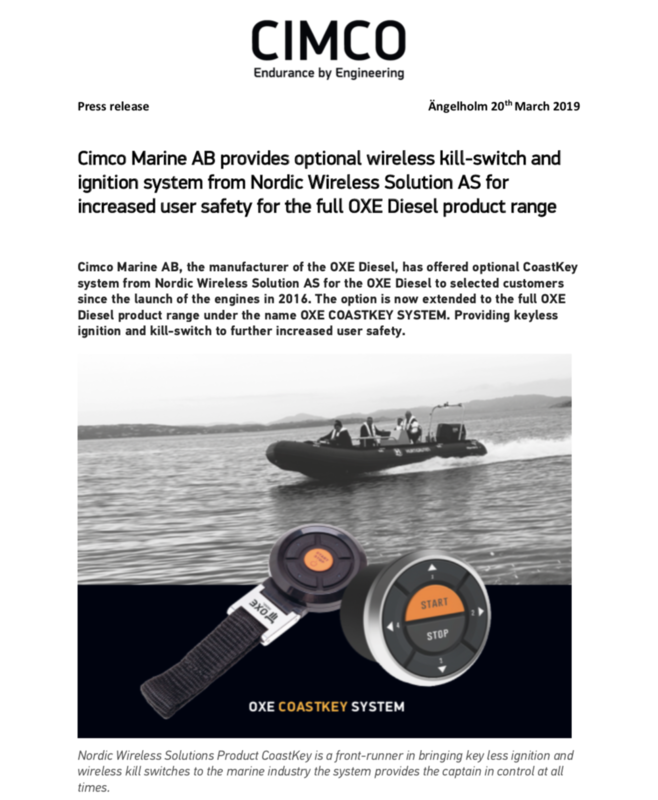 Additional wireless functionality can easily be added to allow features such as wireless tilt, anchor windlass or bow thruster controls. We are proud to announce our partnership with Cox Powertrain Ltd.. We share the values of excellence, safety and innovation with Cox, in addition to a demand for reliability and convenience at sea. CoastKey is an innovative Keyless ignition system. Keyless starting of the engine(s) is performed using a changeable specific PIN code. The keys don’t even need to be onboard the boat! This is a great feature for yacht tenders where the keys are easily misplaced due to large crews on the yacht. It also allows use of the boat if the keys were left home by accident. Since CoastKey is a modular system, a remote start feature can easily be added. If you choose this feature, additional wireless functions can also be added such as tilt, anchor windlass, thruster controls and more. The remote start feature will also give you a wireless engine kill switch! Safety and security are our priority. The CoastKey FOB performs a crucial function by acting as an engine kill switch. When worn by the captain, it switches off the engine(s) within two seconds if he/she falls overboard. Traditional engine kill switches require the captain to be tethered to the helm. CoastKey provides a wireless connection, so you don’t have to choose between comfort, freedom and safety. Using CoastKey on our Nor-Tech boats, allows us to enhance the owners and captains experience with our boats in a new way. With keyless ignition and a remote control that can control auxiliary functions, we truly move the connections between driver and the boat into 21st century. Also, the embedded wireless kill switch function is especially valuable as it increases safety for operators and passengers.